Specialization: Aquatic PT, general orthopedics, injuries of the foot and ankle. Joint replacements, knee and hip dysfunction, neck pain and balance disorders. Certification: Recognition of Advanced Proficiency for the PTA musculoskeletal. Sarah Schmidt was always interested in medicine, but that heightened when she sustained minor injuries in sports in high school and began to study human biology. It also guided her towards physical therapy as a profession. She completed many volunteer hours in various PT settings such as pediatrics, hospital, and outpatient orthopedics before making her final choice. “I like the idea of physical therapy because of the amount of time you get to spend with the patients, the fact that you get to see and be a part of the progress and the high activity level of the job,” she said. Sarah earned her Bachelor of Science in Biopsychology from Tufts University and her Associate Degree in Physical Therapy Assisting from the College of Health Sciences. She also earned a Master of Public Health degree from the University of Illinios at Chicago. She has been working as a Physical Therapist Assistant since 1998 with experience in long-term sub-acute care and outpatient orthopedics. 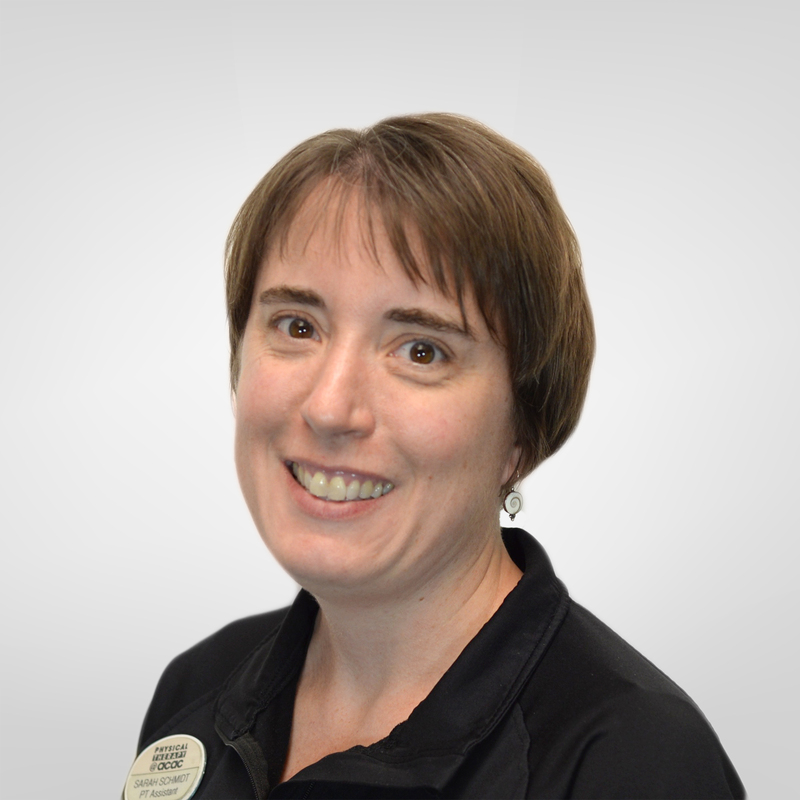 Sarah specializes in aquatic physical therapy and has been spending her afternoons treating aquatic patients since 2002. She also has experience with and enjoys treating joint replacements, foot and ankle injuries, low back pain and neck pain. Sarah has also been working part-time at the Spine Center. Her certification includes Recognition of Advanced Proficiency for the PTA. In her spare time she enjoys running, exercise, spending time with her family, needlework (knitting and crocheting), travelling, reading, and spending the weekends watching her kids play softball and soccer.